Mobile and Cloud Computing are the two dominant transformations driving the IT industry in the recent and moreover, upcoming years. Interestingly, both technology domains seem to be a natural match but no technologically firm and sound framework exists. This important and equally comprehensive problem statement is at the very core of the MobileCloud research theme. We define MobileCloud as Mobile Devices + Mobile Network + Decentralised Computing + Smart Storage offered as One Service – On-Demand, Elastic and Pay-As-You-Go. to extend cloud computing so as to support on-demand and elastic provisioning of novel mobile services. Research under our MobileCloud theme investigates, implements, and evaluates the technological foundations for MobileCloud systems. These systems will meet real-time performance needs, support efficient and elastic use and sharing of both mobile device, radio access, and mobile core network resources. Mobile network functionality will run on enhanced mobile cloud platforms leveraging commodity hardware. This requires extensions towards higher decentralization and enhancing those functionalities to elastically scale up and down based on load. The end-to-end control and management orchestrates infrastructure and services across several technological domains: device, wireless, mobile core and data centres, providing guaranteed end-to-end SLAs and AAA as well as service mobility. Ultimately, MobileCloud platforms will allow smart devices to seamlessly exploit the power of the cloud by offloading computational and storage load transparently for the user and at the same time consume all sorts of cloud services with guaranteed service and experienced quality. Besides the technological aspects, MobileCloud research identifies and evaluates overarching novel business models that support the exploitation of the mobile cloud in various multi-stakeholder scenarios. 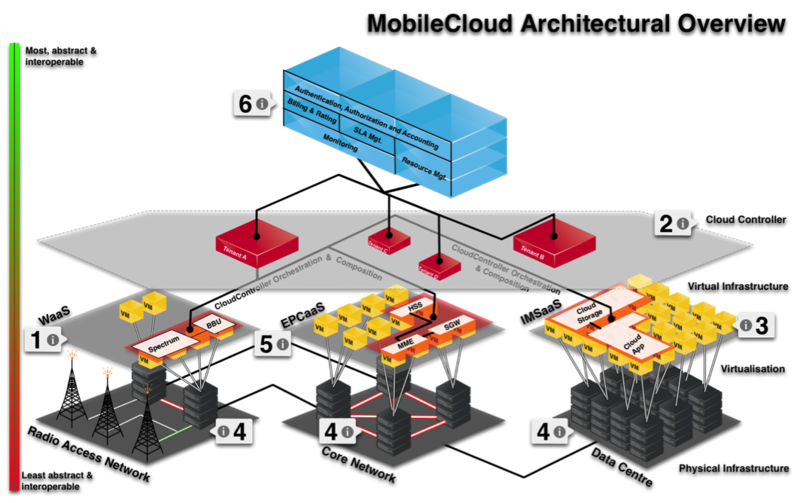 MobileCloud architectures are evaluated in realistic scenarios and with a set of concrete use-cases, based on actual applications. These evaluations are done from diverse viewpoints, exploiting research in well-balanced and representative consortia, including leading industry from the telecommunication as well as the cloud computing segments. Today the Telco industry fails to seize the vast commercial potential of cloud computing, and this, oddly enough, in view of the inherent reliance on communications for cloud access. Instead, cloud computing catalyses the pressure on networking. Mobile Cloud Computing lacks an accepted definition. This poses a unique opportunity for Europe. The top-level objective of MobileCloud is to seize this opportunity. It will leverage on Europe‟s excellence in mobile communications and extend it into the cloud arena, which is almost exclusively in the hands of US companies. The MobileCloud Networking project will define and evaluate Europe‟s vision of mobile cloud computing. It will enable European Telco industry to take and sustain leadership in mobile cloud computing and thus a fundamental pillar of the Future Internet. One issue is that cloud computing is an invention of the software industry and frequently not well understood by Telco experts. Meanwhile “cloud” is too often turned into a buzzword to prettify old ideas, which rightfully poses questions on any “cloud” proposal. It is therefore important to understand the distinct concepts, both technological and economical, of Cloud Computing in order to penetrate the innovative vision of MobileCloud Networking – which establishes a sound vision driven by technological concepts and business drivers – clearly beyond the combination of two buzzwords. MobileCloud Networking will investigate, implement, and evaluate the technological foundations for such a system. It will meet real-time performance needs, support efficient and elastic use and sharing of both radio access and mobile core network resources between operators. Mobile network functionalities – such as baseband unit processing, mobility management and QoS control – will run on the enhanced mobile cloud platform leveraging commodity hardware. This requires extensions towards higher decentralisation and enhancing those functionalities to elastically scale up and down based on load. The end-to-end control and management orchestrates infrastructure and services across several technological domains: wireless, mobile core and data centres, providing guaranteed end-to-end SLAs and AAA as well as service mobility through the Follow-Me Cloud concept. Besides the technological aspects, MobileCloud Networking will identify and evaluate overarching novel business models that support the exploitation of the mobile cloud in various multi-stakeholder scenarios. The MobileCloud Networking architecture will be evaluated in realistic scenarios and with a set of concrete use-cases, based on applications such as mobile cloud enabled digital signage. The evaluation will be done from diverse viewpoints, exploiting the well-balanced and representative consortium, including leading industry from the telecommunication as well as the cloud computing segments. MobileCloud Networking is a European research project funded by the European Commission. In total top-tier 19 partners from industry and academia commit to jointly establish the vision of MobileCloud Networking over the period of 36 month. The total investment is roughly 16M Euro. The project is coordinated by SAP and ZHAW is the technical leader. 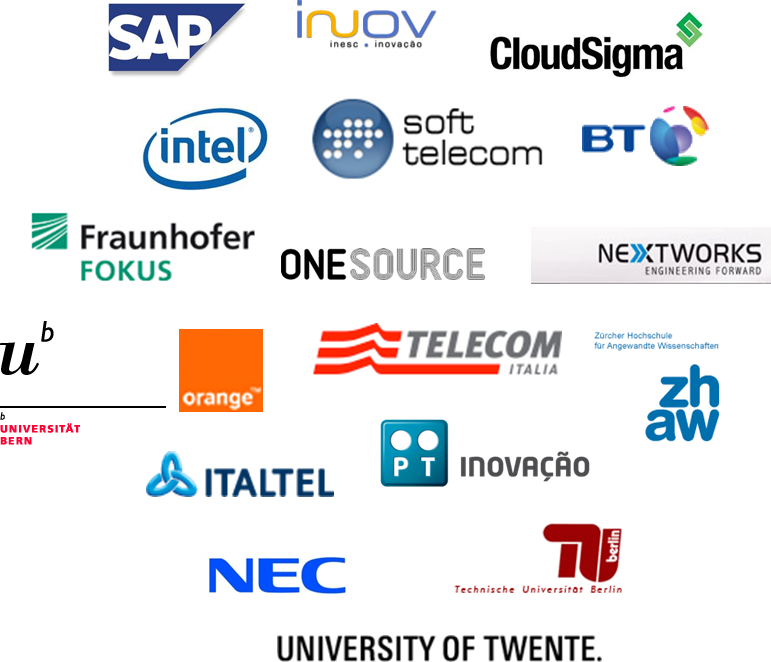 Partners are France Telecom – Orange, British Telecom, Telecom Italia, Portugal Telecom Inovacao, NEC, Intel, ItalTel, CloudSigma, NextWorks, SoftTelecom, ONESource, University Twente, Technical University of Berlin, INOV – Technical University of Lisbon, University of Bern, and Fraunhofer. This entry was posted in Mobile Cloud Networking by TMB. Bookmark the permalink.